Like any other holiday, Thanksgiving means different things to different people. For some, it's an occasion to pause and reflect on all the marvelous blessings they have in their lives. For others, it's a massive guilt trip for not feeling more grateful on the other 364 days of the year. And for the rest, it's an excuse to joyfully gorge on their favorite dish—candied yams—since no one in their right mind serves that slop at any other meal. But no matter what you're thankful for, one thing is for sure—sooner or later, that Thanksgiving gratitude will creep into your heart. I believe we've established how I feel about dedicating the entire month of November to setting off Facebook confetti cannons of gushy praise for everything from Junior's above-average cuticle grooming to the miracle of indoor plumbing, but even I can't resist reveling in the warm fuzzy recognition of all that's right with my world...eventually. Sometimes it just takes a little longer than others. 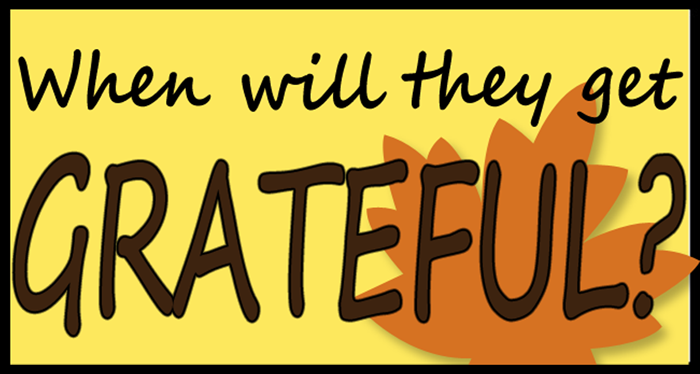 I usually start gearing up the gratitude during the days leading up to the big Hug-fest Feast. However, don't worry if turkey day arrives and your family still hasn't started appreciatively swooning with appreciation for all the good fortune they're supposed to be appreciating. It's not too late! Thanksgiving isn't ruined until a fight breaks out on the lawn; barring that, the spirit will strike them at some point. Different people simply start feeling the love at different times. Grandma: The moment she arrives at your home, which is filled with loving family and the mouth-watering aromas of a Thanksgiving meal that, after 45 consecutive years, she finally didn't have to cook herself. Aunt: When you show her where the secret stash of extra wine is hidden. Uncle: When he's offered the "honor" of carving the turkey...and manages to slip out of the room after successfully pretending he didn't hear the offer. Sister-in-law: When she determines your turkey is much more dry and gamey than hers was last year. Kids: When someone leaves the spray can of whipped cream unattended. The Black-Sheep Cousin: During his first 30-minute smoke break that suspiciously doesn't leave him smelling like, um, regular smoke. Dad: As soon as the Big Game starts. Drunk Uncle: As soon as Dad's favored team in the Big Game starts losing, thus giving him something to comment about loudly. Grandpa: As soon as he stops trying to get Drunk Uncle to shut up, pops his hearing aid out and falls asleep on the couch. Mom: After an elaborate meal is cooked and on the table, everyone has had thirds, she's steered the dinner conversation away from religion, politics, and her sister's plastic surgery, the dishes have been cleared, washed, and packed away in the special spot reserved for the holiday china, and (of course) she breaks up the inevitable fight on the lawn. 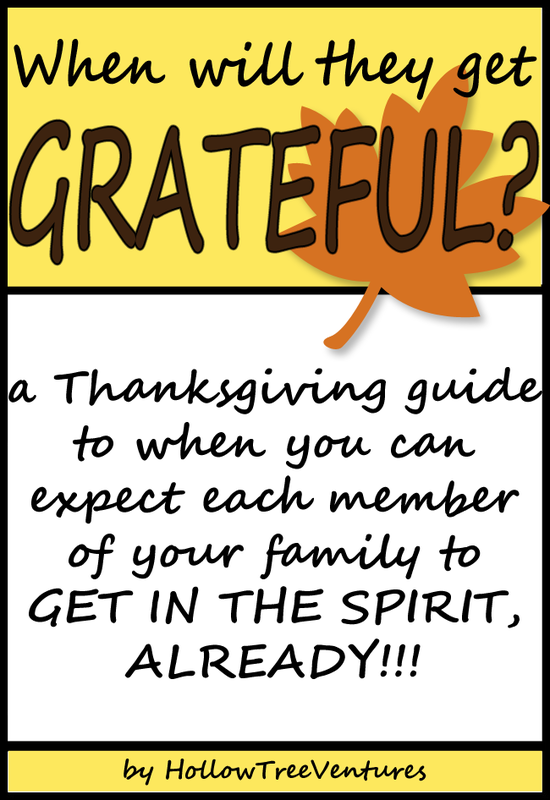 Happy Thanksgiving, everyone—whenever you start to feel the spirit! Obviously, you've been to holiday dinners at my house!! I'm actually kind of thankful there's no Thanksgiving in my neck of the woods so I can avoid, not only the embarrassing relatives-fighting-on-the-lawn issue (most of my family is seriously passive-aggressive, but that only goes so far, especially since the family on my wife's side is more...um... active-aggressive). but also the cleaning up the wife & I would inevitably get stuck with after everyone left. I am grateful that my Thanksgiving (Canada) is already past. and that I have a large family......and a small house that no one wants to come to. except my mother, who shows up with a cooked turkey, dressing, and a large bottle of wine. I know I am spoiled and I don't care. Ah yes the inevitable fight on the lawn. I don't care what my family says I'm totally taking grandma down this year. I hope you've been working out! I ripped the turkey apart with my hands. I was grateful that my family totally understood that it's the way it had to be. I was also grateful that my drunk uncle forgot our address.